"The Night Life" Golden Gate Bridge San Francisco, California. 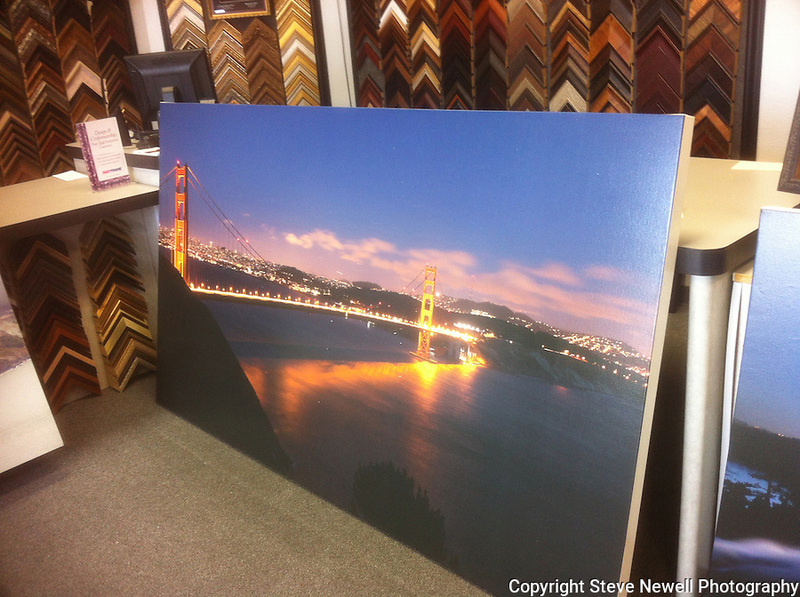 A stretched canvas print at the frame shop leaning against the counter. It is a 48x84" museum wrap. I specialize in Large Oversize Fine Art Landscapes. It is unusual for a night shot in a large print format to have such sharp detail of the Golden Gate Bridge and the City. A few of the things I like in this photograph are: the colors of the bridge, the shadows of the cables on the Pacific Ocean, looking at the ocean you can see how the waves are moving in several different directions (something not readily visible during the day), white clouds being illuminated by the city lights and are slightly blurry showing that they were moving, the detail of all the buildings and their light in the windows, the Trans America building on the left, the Presidio on the right, the little slivers of light in the sky are airplanes in flight, stars in the sky high above the city and the cars driving over the bridge look like a laser beam of light but when you look closely you can see little bubbles of light sticking out above the main stream of light due to the cars bouncing on the suspension bridge. I didn't realize how much the vehicles bounced until I viewed their light trails while going over the bridge. I have four different images of this scene with some of them having the vehicle light trails only being little individual lines of light that look like little snakes. I get asked a lot about the camera settings I used to capture this image so here they are: Picture taken on June 24th, 2012 at 9:32pm, ISO 400, 30 second exposure, f13.0 aperture, with a Canon 5D Mark ll and Canon F/2.8 L series lens set at 35mm.